We have sneak peeks to share Tuesday, Wednesday and Thursday. All of the new products will be available for purchase on Friday, June 3rd at 8 am PST. 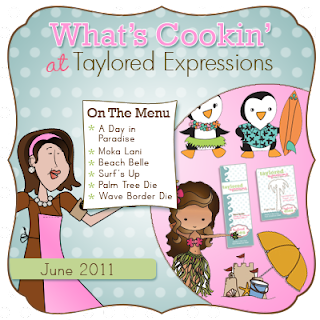 You'll find it all in the Fresh out of the OvenDepartment in the Taylored Expressions Store. Join us as a fan on Facebook for an early peek at the stamp sets on Thursday night beginning at approximately 6 pm PST. Special Early Bird Offer on Release Day for the first 15 orders over $100. It's TOTALLY SWEET! Mystery Baker's Dozen Blog Giveaway: Each day one lucky blog commenter will be chosen by random draw to win a $10 TE Gift Certificate. Winners will be chosen from a different Baker's Dozen blog each day and all will be announced on Taylor's blog on Release Day! Be sure to hop around to see all the sneak peeks and leave comments on each and every blog for more chances to win. Limit one comment per blog per day, please. Comments close Thursday 6/2 at 7pm for the drawings. Guess what?! Today the Baker's Dozen of Taylored Expressions start their sneak peeks from this month's new releases and I am so in love with all the amazing and awesome stamp sets and awesome dies and impression plates! On today's Menu: we are sneaking peeks of the full size stamp set: A Day In Paradise and will continue the Moka series with Moka Lani and two stamp sets with the sweet little penguins with the Beach Belle and Surf's Up stamp set. I love the new dies that Taylor is releasing - one of them that we are sneaking peeks of today is the new Wave Border die which is perfect for summertime cards! The stamp set A Day in Paradise is simply pure summer magic - all of the stamp sets are so nostalgic of summer at the beach house - where all one does is just lounge by the beach all day in the warmth of the summer sun. This gorgeous stamp set (full sized set with 21 stamps) is illustrated by the sweet Nancy McKinney and is perfect for retirement cards, summer cards, vintagey cards, and just because cards (and everything in between). 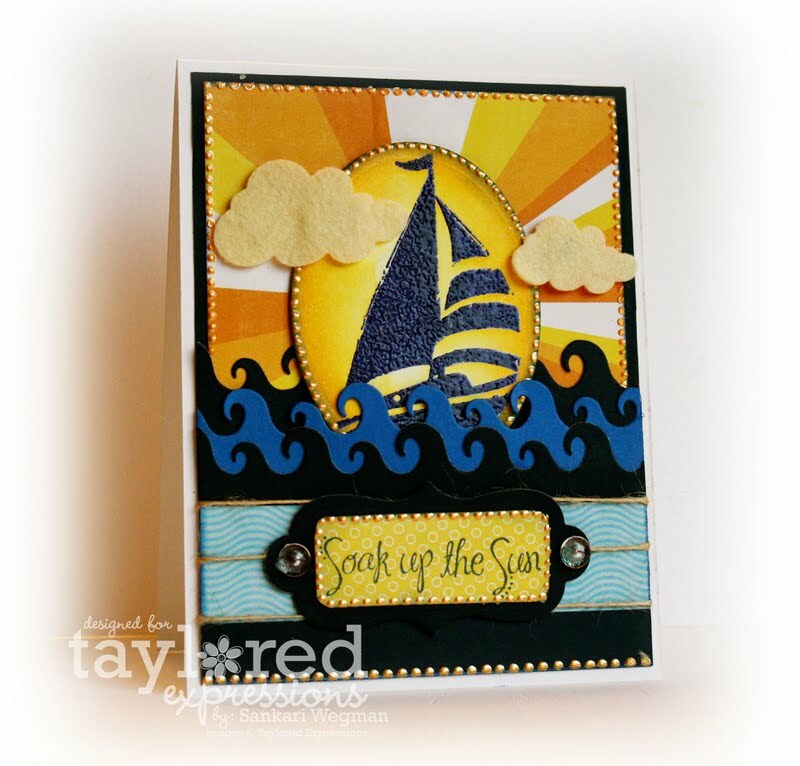 I love this sailboat image in this stamp set and wanted to create this card for my DH who loves to sail - I embossed the sailboat image and then sponged with a gradation of yellows and oranges after cutting it out with an oval nestiies and then paired it with the papers from the Splash 6x6 pad from EP. I layered a few pieces of different shades of blue cut with the wave border die and layered that at the bottom of the image and then used the Clouds Duo die to cut some clouds out of felt that I then layered on the sailboat image. Accessories: wave borderoval spellbinders, liquid pearls, twine, tags, Clouds duo die from Taylored Expressions, dimensionals and felt. 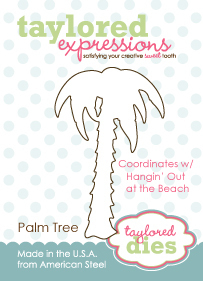 The second card uses the new Palm Tree Die to coordinate with the palm tree stamp in the Hangin' Out by the Beach stamp set. I love all the Hangin' Out stamp sets - and the Hangin' Out by the Beach stamp set has a wonderful palm tree that is so cute - but can be hard to cut out (and trust me, I LOVE to cut things out!) so - it is so delightful to have a die that coordinates with this stamp set and can easily cut out the inner corners of the palm trees with precision in one roll of a die cut machine! I used this stamp set with the Palm Tree die with the papers from Lime Twist from My Mind's Eye. Accessories: clear tear drops, baker's twine, dimensionals, wonky and circle nestabilities, liquid pearls, circle punch and dimensionals. I am so excited that my parents are visiting myself and the kids this week - its been just absolutely lovely and sweet and awesome - all rolled into one! I have already made a few things for my mom ad dad - but I wanted to make a special little something to show them how much I love them. Any good qualities that I might have are all there because of my parents and those values and lessons that they taught me - are all things I see myself saying and teaching my children. I am so forever grateful to my parents - for every single thing that they have done - and for everything that they do for my wee ones - and so I wanted to make a card for them that my kids could sign on the inside - with pictures of the kids and the sentiment: "You make a difference in my life" from the Bloom and Grow stamp set from Verve stamps. I loved making this card - maybe it is because it was for my parents and that it had pictures of our children that made it so lovely to make this card :) I stamped the frame from the Sweet Treats stamp set and popped it up over the pictures of the kids. These pictures were cut out with the embossed oval die and then adhered to the DP and then I popped the frame over them with dimensionals. Thank you so much for coming over to visit today! Hambo Stamps - Guest Designer - Party Sheep! Today I am so excited to be a Guest Designer for Hambo Stamps - a stamp company filled with the cutest little stamps and they also have the most hilarious sentiments in their stamp collection! I love that one of their sayings on their website is: "Go ahead, laugh at us"! you gotta love that - lol! Accessories: Martha Stewart Grass Punch, EK success border punch, Spellbinder nesties, copics, sponger, ribbon from stash, dew drops and dimensionals. 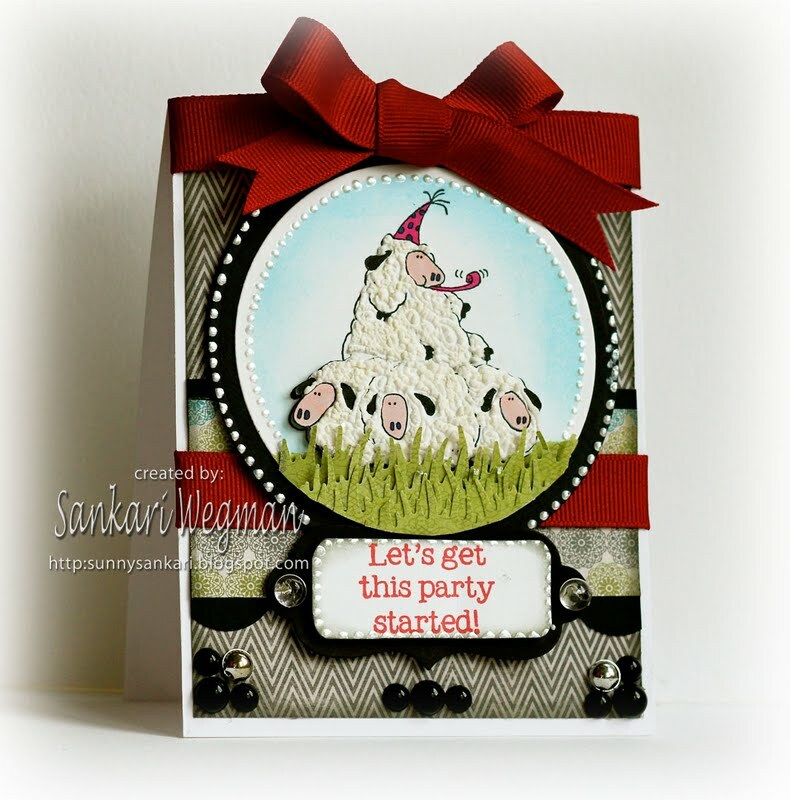 A huge thanks to dear Libby and Monica for letting me play along today - I can't wait to make more cards with these party sheep! Please check out all the stamps here on the Hambo website! Today over at the JustRite blog - we are doing a special and fun blog hop with the wonderful ladies from the Stamper's Dream DT and are celebrating the newly released stamps from JustRite with some wonderful prizes! Prizes - you say?! YES!!! There are 3 Mystery Blog Candies that are hidden somewhere along this hop and for a chance to win one of the fabulous prizes - all you have to do is to leave a little comment on each person's blog since we don't know which blog will have the Mystery Prize! All 21 locations on this hop are eligible for the Mystery Blog Candy! 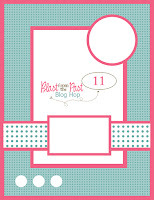 AND you are going to love checking out all 21 blogs - because this hop with the Stamper's Dream DT is simply full of amazingly talented ladies who are my constant inspiration - I can't wait to hop along! 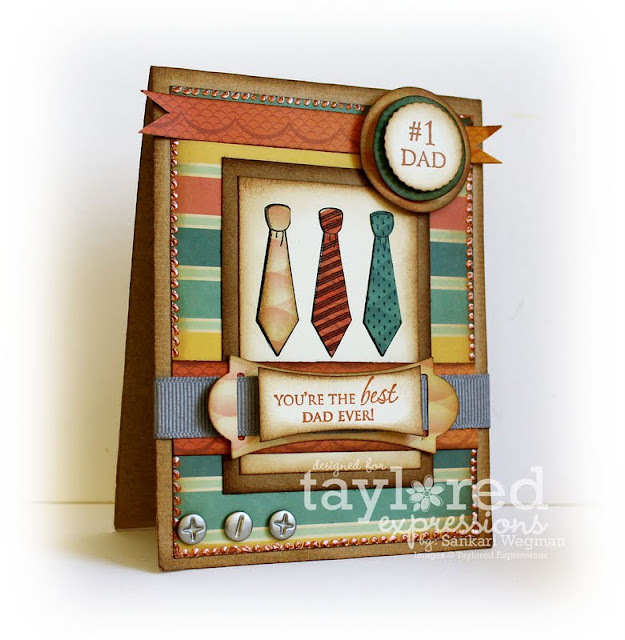 For today's project - I used the sweet stamp set: You are the Best Stamp set- to create this card for our son's teacher. As the school year starts to end - the amount of graduation parties and graduation celebrations are stacking up - and I am so glad I have a chance to create a sweet thank you card for our son's wonderful teacher. She is just a ray of sunshine and I wanted to create a bright and cheery card for her and love that this stamp set comes with so many different stamps that you can use with the "World's Best" sentiment - including "teacher". Accessories: EK success border punches, liquid pearls, dimensionals, glitter, button from BG, twine and bling - ribbon from stash. 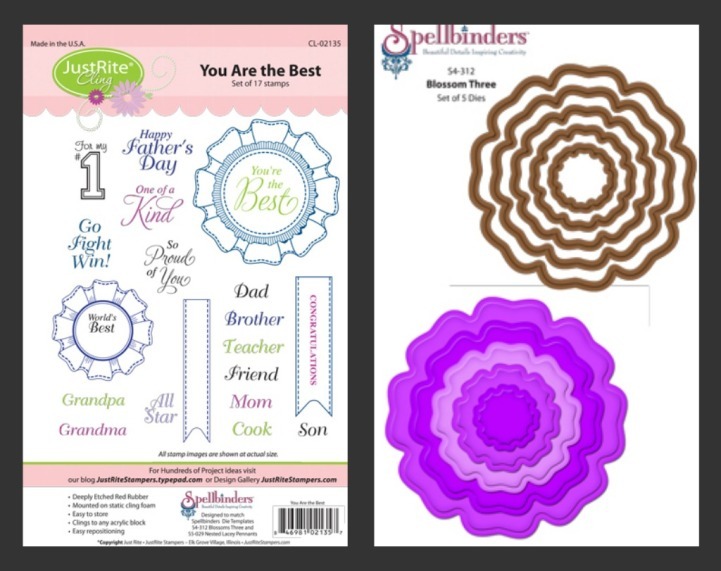 Prize #1 -- You are the Best stamp set- this is the stamp set that I used today - and it coordinates with the Spellbinder's Blossom dies - you could win BOTH stamp set and coordinating die as one prize!!! awesome! 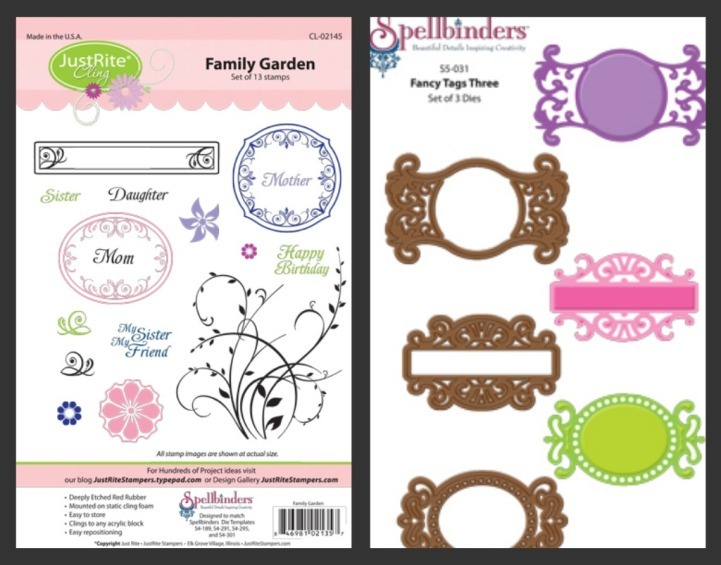 Prize #2 - you could win the Family Garden stamp set along with the Fancy Tags 3 coordinating die from Spellbinders - BOTH of them - in one prize!!! Isn't that awesome! 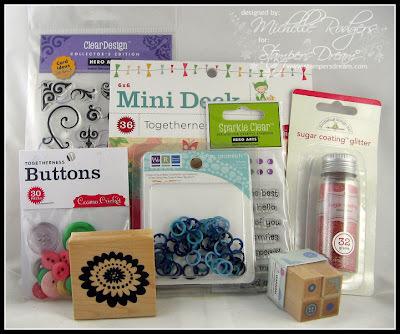 Prize #3 - Check out the awesome goodies in this prize - All of these crafting goodies make up a prize - can you believe all the yumminess involved?! One of my friends is getting married this summer and wanted some tags and signage for her wedding - so I created some tags that she can display at place settings or at the table with all the food. Her colors are light purple and cream - and so it was fun to pick out papers and embellies that had these colors. Here is a picture of three of the above tags. 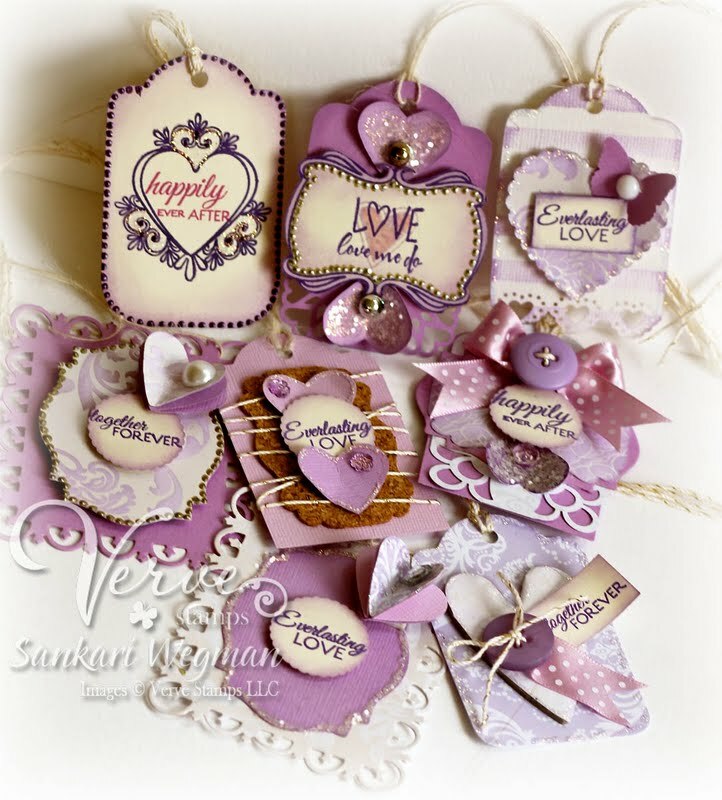 The one on the left - the heart is a piece of chipboard covered in some DP from SEI and a button ribbon tag using the sentiment: "together forever". The one in the middle has a frame from the Love Story stamp - but the sentiment is from the Love Notes stamp set. The last one is a really simple tag - with sentiment and image from the Love Story stamp set. I attached the tags with a bit of twine since her wedding theme is an outside elegant vintagey wedding. Accessories: twine, cork, heart lattice punch, heart punch, butterfly punch, heart corner punch and scalloped corner punch are from Martha Stewart, chipboard heart, dimensionals, buttons from PTI purple vintage buttons, liquid pearls, stickles (diamond and crystal), bling-pearls and silver dots, corner punch, tag punch from CM. 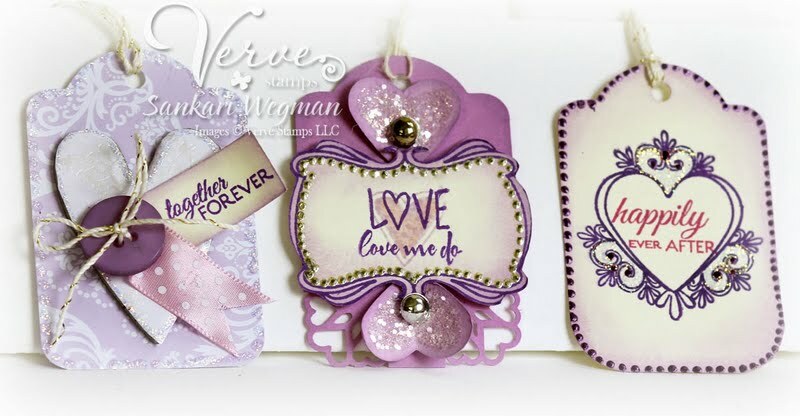 I was so amazed at how quickly these tags came together - I just adore these stamp sets - Please check out all the stamps over at the Verve Stamps site! I always love making things for people I love - and I loved every single second of making these tags. I am so happy for my dear friend and so excited for her and her fiance as they begin this new chapter! Will post more pics after the wedding! Accessories: circle nesties, ribbon tag trio 3, brads (screws), liquid pearls, ribbon from stash and dimensionals. Please check out what all the wonderful designers have created for this special hop and make sure to sign up for the next one! You can check out all the details here! Today is an exciting day as a lot of different crafters have come together to celebrate the birthday of one very awesome and wonderful person: Ms. Lori Craig! Lori has such a generous heart andI feel so lucky to have hung out with this special lady who has a beautiful heart and smile! 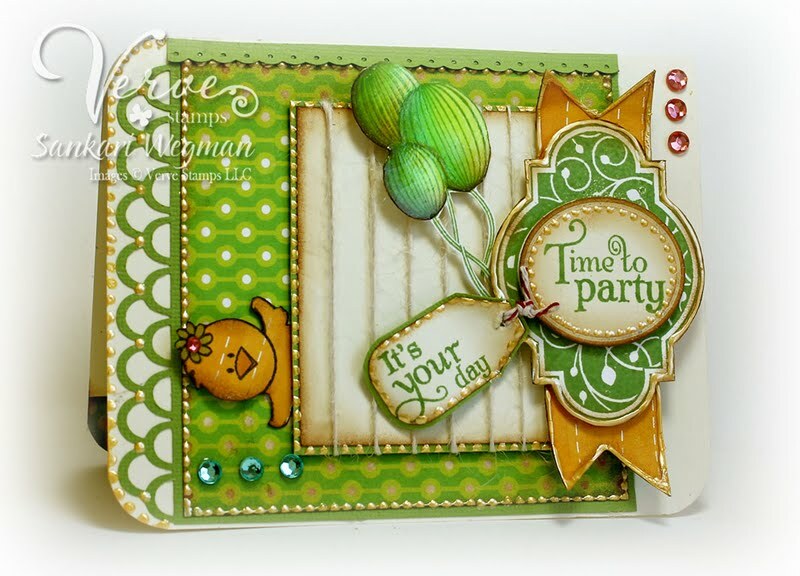 I wanted to make a fun party card for this awesome chickie - so I had to use the cute little chickie Chole from the Chicks Rule stamp set from Verve stamps with the Mojo 191 sketch (seriously love this sketch - had to use it again!) The sentiments are from the super cute Party Time set - paired with the frame from the Sweet Treats stamp set. 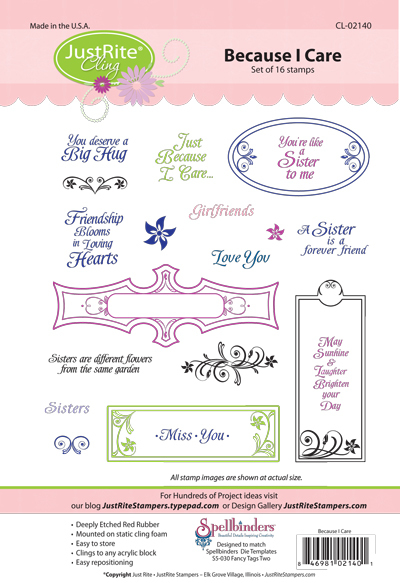 Stamps: Chicks Rule , Party Time and the Sweet Treats stamp set from Verve Stamps. Accessories: dimensionals, bling from Bo Bunny, Embossed Oval Die, twine from May Arts, edger punch from Martha Stewarts, glaze, copics and liquid pearls. and that everyday is filled with sunshine and laughter! 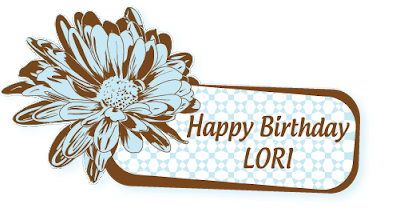 Wishing you a wonderful and Happy Happy Birthday dearest Lori!!! Please by Lori's blog here and leave her some birthday love! 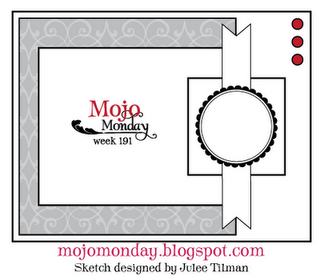 Mojo Monday #191 - God Bless! I am in desperate need of mojo - really - its pretty desperate here - I actually sat in front of my craft desk all evening with not a drop of creativity... sigh... I looked through papers, card magazines... blogs... nada... everything looked beautiful - but I couldn't figure out how to make it work.... sigh... but this morning - I thought to look at the Mojo Monday blog - and sure enough- Julee has a fantastic sketch (Mojo Monday #191) that is sure to get your mojo flowing - I LOVE this sketch - it seemed so easy to keep it clean - and simple - two things that I am not good at :). 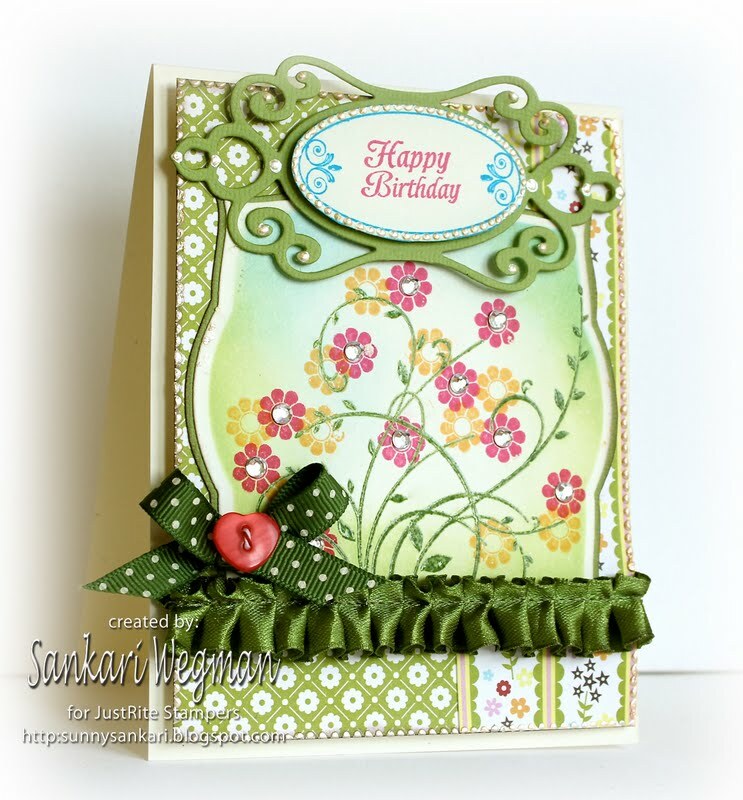 I turned the card vertically and used the gorgeous stamp set: Hope Blooms from Verve stamps and stamped the largest flower onto the DP from the Summertime collection from Echo Park. 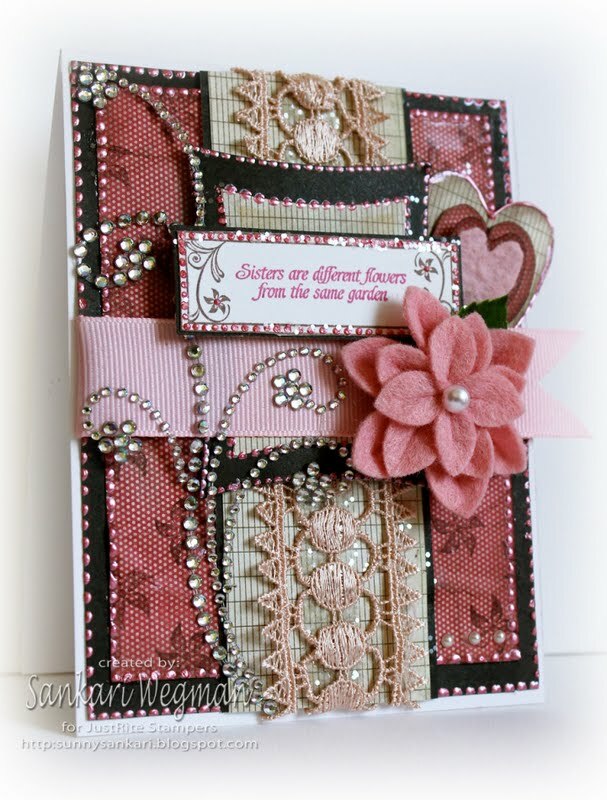 I love love love how this flower looks stamped, paper pieced or colored in. 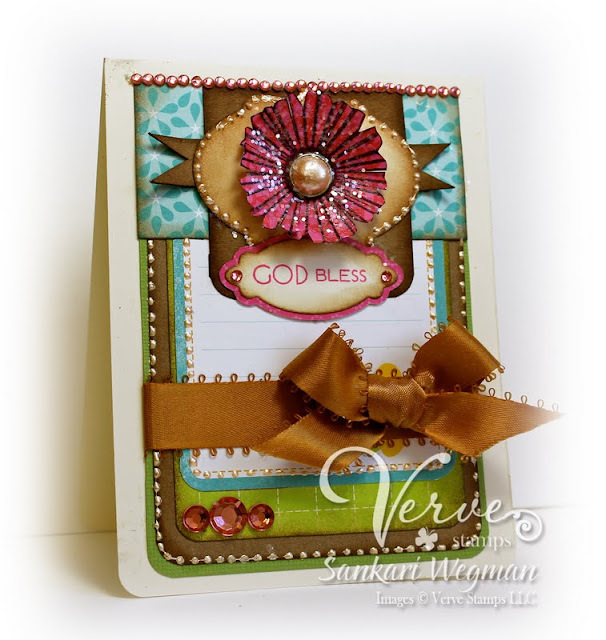 I cut out the edges and placed it onto the classic oval vintage die from Verve Stamps and used the beautiful sentiment: "God Bless" from the Faithful Phrases stamp set from Verve. Stamps: Hope Blooms and Faithful Phrases stamp set from Verve. I love ti when mojo strikes - I woke up this morning - made this card - and then fed my kids breakfast, got them dressed and out the door for school! Hooray for a fun morning! Hope your day is filled with fun and sunshine and beauty! I have been running like a chicken without a head - kinda - its been simply so crazy busy - but in a good way - I honestly don't know how the days are flying so fast! We just had a get together tonight for 3 very sweet families who are leaving our small town and are moving to other parts of the US. 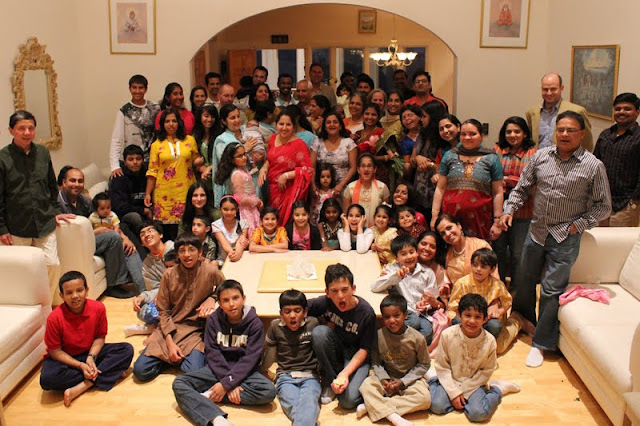 The Indian community in our town is so very sweet - and close - and so it was a bitter sweet joy to come together to celebrate this new chapter that is opening up for these families but a sad one for us as we will feel the void when these families move. 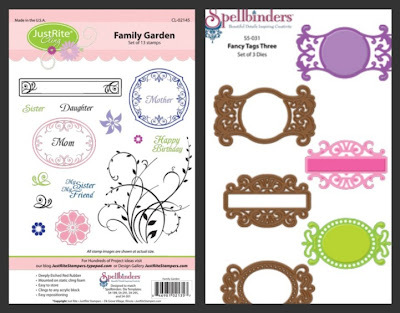 Accessories: Scallop and circle punch for trees, Nesties (labels and scalloped nestie), liquid pearls, MS edger punch and ribbon from stash. I don't usually share pictures other than cards here - but I wanted to share a special picture from our Farewell Party tonight - it was such a joy to have everyone sign it and to give it to the families who were leaving - so bittersweet .This picture was a difficult one to capture - so many families and little ones all having to stay still - but so worth it!!! Feeling very grateful for all the different kinds of families that we have here - families by blood, by friendship, of the heart - so very sweet! a wonderful week of joy! 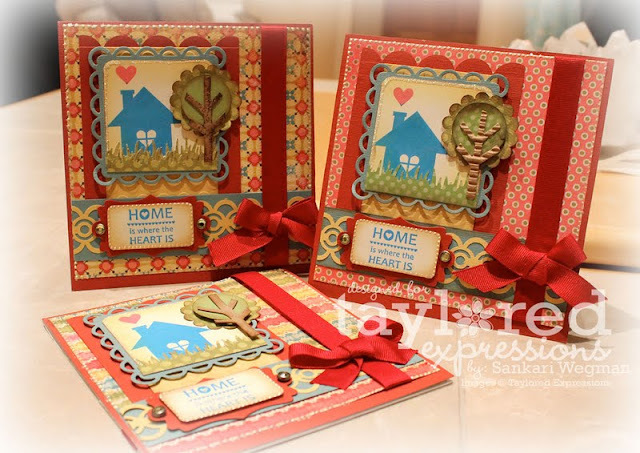 Today over at the JustRite stamp blog - we are peeking samples from the beautiful stamp set: Family Garden! This stamp set made up of 13 cling images is part of the JustRite Cling stamps collection. I stamped the vine in Bamboo green ink and embossed it with clear EP and then sponged the edges. The flowers were stamped with two different inks and I put a little bit of bling in the centers of the red flowers. I finished it off with some pleated green ribbon and a heart button ontop of the green polka dotted bow. Today over at the JustRite Stamps blog, the Design Team is featuring the sweet new stamp set: You're the Best which coordinates with the tags from the Nested Lacy Pennants and the Blossoms 3 nesties from Spellbinders. 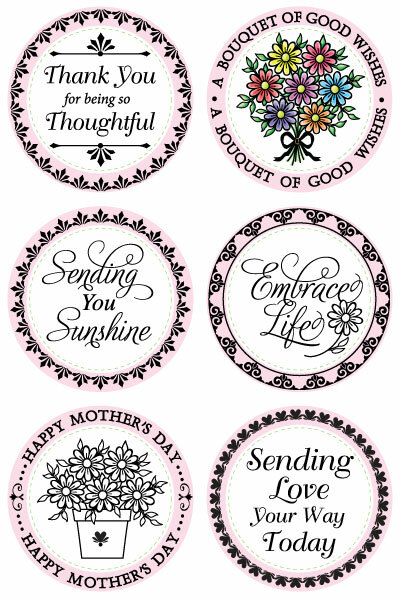 This stamp set is part of the JustRite Cling stamp sets and comes with wonderful sentiments that can fit into the blossom shapes or on the tags - or can be stamped separately. I stamped blossom flowers in Memento onto BG DP and then cut them out and layered them ontop of each other. For the leaves, I used the tags and paper pieced them onto green Dp and then added some glitter on top of tags. I attached a button with some embroidery thread in the middle popped it up on to the top of the DP arrangement. The coolest thing about the tags, is that there is a gap or hole in one of them that allows you to pop the sentiment into it - this means that you can stamp very easily in two colors. I stamped the frame tag with some Memento black ink and then inserted the sentiment: "Congratulations" that I had already stamped with some Ladybug Red ink. I added a little bit of gray satin ribbons, a thin line of mesh metal and edger punch from MS and finished off some edges with a little bit of liquid pearl dots. I added some white cardstock to the inside of the card for easier writing. 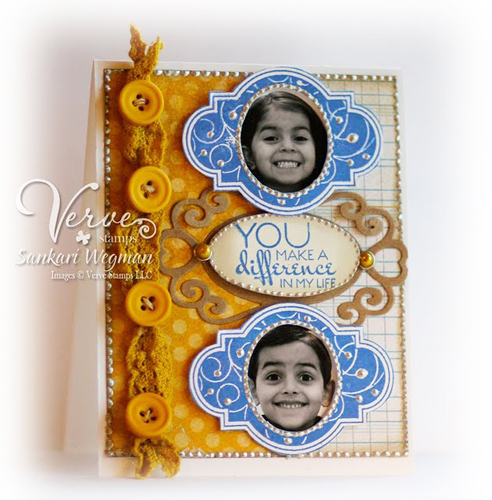 I can't wait to see all the gorgeous creations using the You're the Best stamp set from the JustRite Design Team = please hop along with me and check them out! Hope you had a wonderful mother's day weekend. My weekend was very simple and sweet and jam packed with activity and hustle & bustle - lots of love and fun! I loved being around all my mama friends, talking to my MIL and mother and being with my kids - very grateful all these wonderful women who nourish my heart! I love all the sweet sentiments and the frames create such a lovely versatility with using the other JustRite sentiments and also coordinating it with Spellbinders nesties. 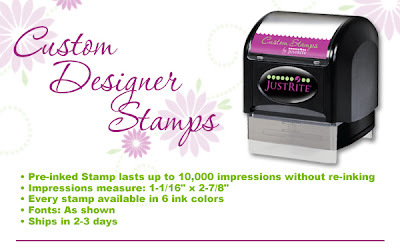 I am so excited to check out what the JustRite DT have created using these two stamp sets! Please hop over with me and check them out! JustRite Stamps: Introducing: Sending You Sunshine!!! 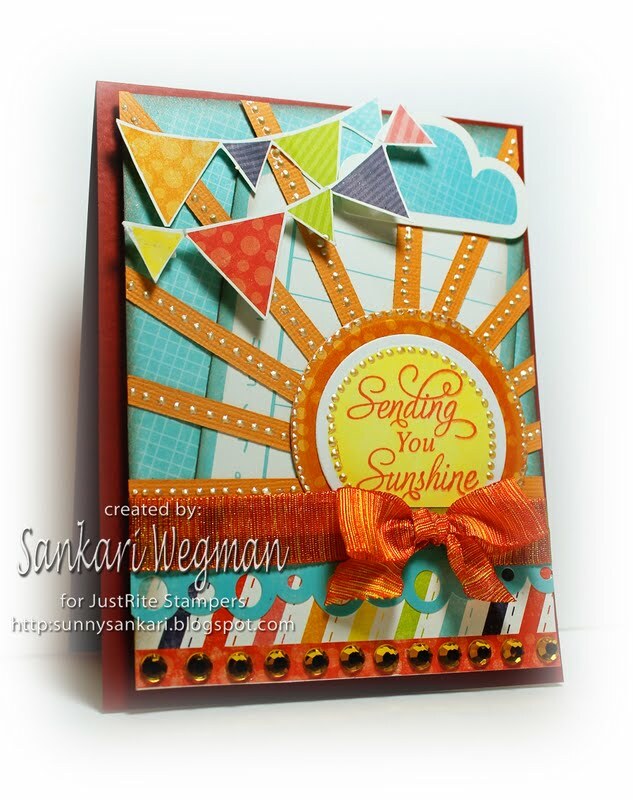 Today over at the JustRite blog, we are sneaking some samples from the gorgeous stamp set: Sending You Sunshine stamp set which fits into a 2" stamp set and has 6 designer centers and 6 borders. As soon as I saw the name of this stamp set, immediately already fell in love with it - I love all things sunshine - and then I saw the beautiful sentiments and sweet images and I totally loved everything about this stamp set! Have a wonderful Friday and the start to a wonderful weekend! Taylored Expressions Sneak Peeks - Day 3 !!! !